The Dutch Maids supply all cleaning products and equipment to clean your home. We are confident that all of our products are the safest, most effective cleaners we can bring into your home. We test and evaluate the cleaning products we use, and are proud to use products that are not only safe for your children and pets, but are also safe for the environment. 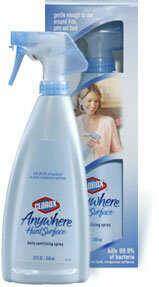 One of the newest additions to the group of products Dutch Maids uses is Clorox Anywhere Hard Surface Spray. A remarkable product that is powerful enough to kill 99.9% of bacteria, yet gentle enough to use around food, kids and pets! Our top-level cleaning equipment, such as the microfiber towels, enable us to use as little product as possible. In some cases, we are able to deliver superior cleaning using only common solutions such as vinegar and water to keep your home clean and disinfected. The Windsor Sensor Upright makes use of a 1.6 hp vacuum motor to pull even more dirt from your carpet before its high efficiency filtration system traps 99.6% of contaminants 0.3 microns or larger for improved indoor air quality. This machine is the standard for efficiency and effectiveness. It is the perfect combination of power and precision to get even the tightest corners of your home as clean as they can be. The TailVac is a preferred tool of professional maid services across the country. This unit is powerful for tough jobs and perfect for quick cleaning or detail jobs. ProTeam Vacuums are equipped with a unique Four-Level Filtration® system that captures tiny dust mites, bacteria and floating particles - particles that create unhealthy air. ProTeam's unique method of suction vacuuming cleans carpets, hard floors and other surfaces without stirring up dust - so the air stays cleaner and the furniture collects less dust. Microfiber is one of the most important advancements in cleaning technology. During the manufacturing process, fibers are repeatedly split until they are up to 30 times finer than typical cotton fibers. These microfibers are then knitted into soft, pliable cleaning cloths that are packed with tiny filaments that trap soil, remove bacteria, and absorb moisture for streak-free cleaning.